Comments Off on Bruins Fan Bus To Napanee! The Uxbridge Bruins are in the Eastern Final and would like to have you join us for a road game. 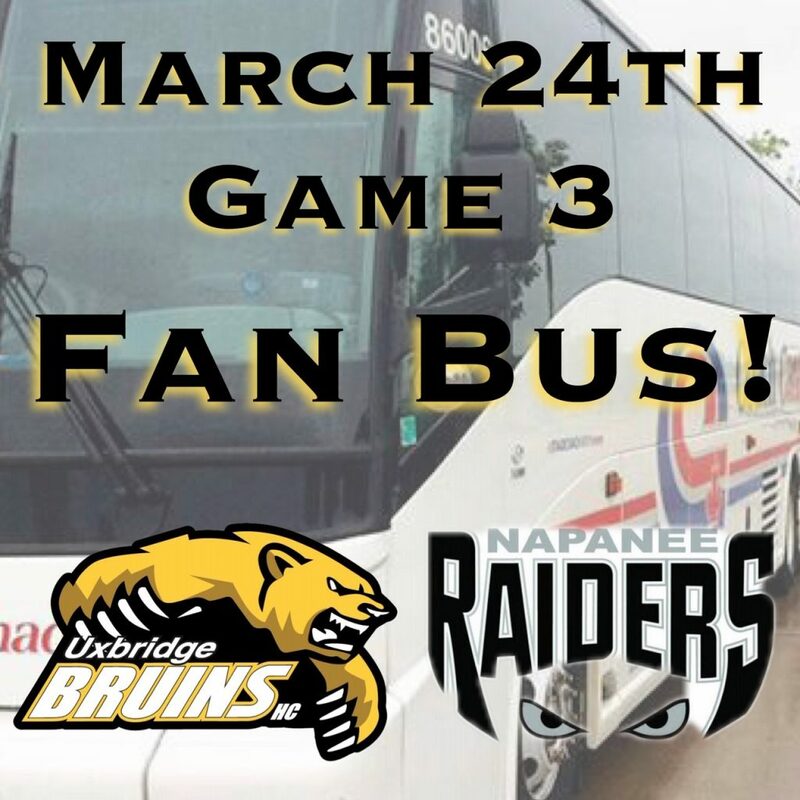 We are considering taking a fan bus to Napanee on Sunday the Mar.24th. Bring your own food and drink to have on the bus. The Bus would be leaving the Uxbridge arena at 4:30 pm sharp, making a pick up at 4:50 pm at the Iroquois Sports Center in Whitby and then heading to Napanee for the game. There would be a cost of $25.00 per person payable at the time of departure ( cash only ). In order for us to book the bus we would need to know how many people are interested in this adventure. Please email Terry Sovie at terrysovie@gmail.com to confirm your booking. If there is not sufficient interest we will not be moving forward with this event. Thank you for supporting your Uxbridge Bruins !!! The Bruins won a hard fought battle, 4-2 win over the North Kawartha Knights to become the first Bruins Cup winning team since 2009. It only took 1:09 into the game to get the crowd on their feet with Joshua Cammalleri banging home a loose puck in front of the net on a nice rush by Simon Feig who passed to Toby Cooper and his shot was stopped but Cammalleri was there to clean up. Cameron Moffitt with a hard wrist shot picked the far side past the Knights goalie Noah Miller. Bennett Britain and Daniel Wu worked hard to turn over the puck and setup the scoring chance. Ryan McConkey was sensational in goal making save after save especially on a huge cross ice glove save that drew the cheers from the crowd. In the second period Justin Bennett hammered home a rebound from Jackson Savery’s initial shot for a commanding 3-0 lead. However the North Kawartha team had no quit in them as they battled back on 2 power play goals, first by Jesse Douglas to end the second at 3-1 Bruins. Just 34 seconds into the third Trent Schutt closed the gap to 3-2 and the Knights pressured the Bruins net with 19 third period shots but could not get another one past McConkey. It is only fitting that the “Workhorse Player of the game” Captain Aiden Reilly, who out worked a Knights defenseman and picked up the puck to score an empty net break way goal at 19:14. As the final buzzer rang, the players, coaches, bench personnel and management staff celebrated the winning of the Cougar cup. 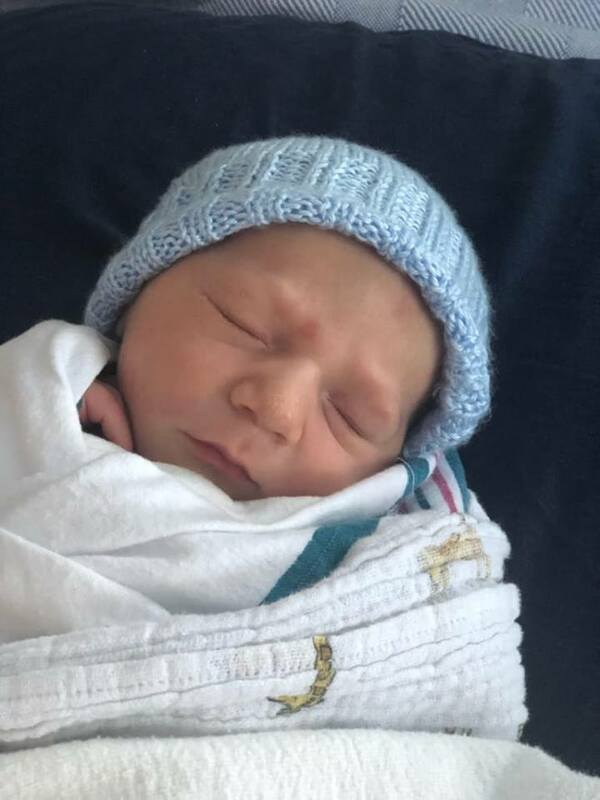 ( Cory “Stumper” Stemp win number 7) Congrats to our hard working executive President Cam Stewart, Terry Sovie, Dale Catherwood, Pat Kielly, Janet McGhee, Elanie Cox and Don Lyons for their behind the scenes volunteer work. You can see pictures on our FB page Uxbridge Bruins Hockey Club. Next series will be announced as soon as possible vs the Tod division champions Napanee Raiders. Thanks to Steve Nagymarosi for shooting this video of his son Steven playing for the Uxbridge Bruins in 2005. Recognize Trevor Cox! Go Bruins Go! Video Link 2005 Central Champions Video! Comments Off on Game Day! 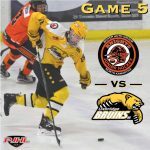 The Uxbridge Bruins are back in action tonight at 8:45 p.m. at the Bear Den for Game 5 of the PJHL Orr Division Cougar Cup Finals vs the North Kawartha Knights. Go Bruins Go! We Believe! 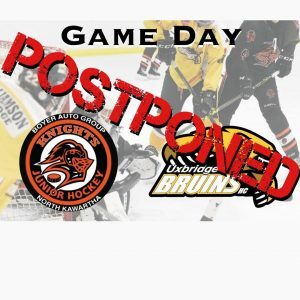 Comments Off on Bruins One Win Away From Couger Cup after Hostile Win in Apsley! Bruins One Win Away From Couger Cup after Hostile Win in Apsley! 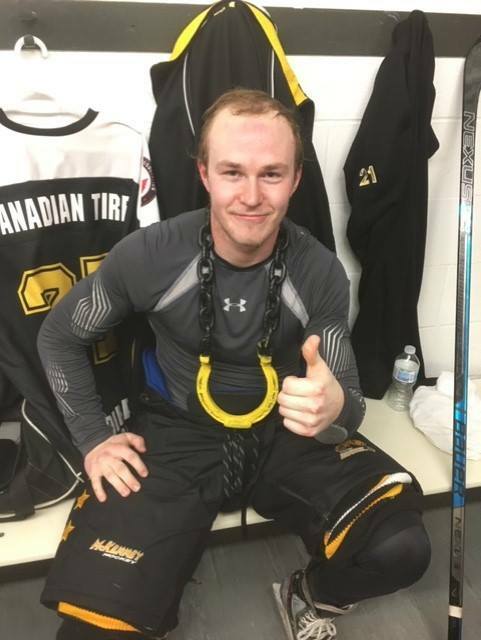 After a 6-3 win Friday at the Bear Den, it was off to Apsley where the Bruins came out flat in this one falling behind 2-0 on goals by the Knights Matt Carroll and Clay Coles, however Toby Cooper (PP) got the Bruins rolling when he banged home a rebound from Mathew Hunter’s point shot. Adam Turner (PP) with one of his patented blasts from the point, tied things at 2-2 and Jackson Savery (PP) with a wicked wrist shot beat the Knights Noah Miller for a 3-2 lead. There was no scoring in the second period as both the Bruins Ryan McConkey and the Knights Miller closed the door in goal. A Joshua Cammalleri shot rebounded to Savery (PP) and he made no mistake giving the Bruins a 2 goal cushion. Carroll (PP) got that back for the Knights setting up a wild finish but Savery got the puck up ice and passed off the boards to Justin Bennett who fired into the empty net for a 5-3 final. Bennett suffered and injury on the play as he was given a two handed slash as he scored taking a few moments to recover. Robert Freckelton was named the workhorse of the game, Congrats Robert. As the Bruins left the ice North Kawartha fans douced the Bruins in pop and threw popcorn on them as well as the coaching staff. Game 5 is Monday Mar.11th at 8:45 pm at the Bear Den as the Bruins will attempt to win the series and the Cougar Cup for the first time since 2009. Pack the den and hear the roar!